From a young age, I have had a strong passion for a healthy lifestyle: from eating the right foods, to exercising, to natural skin care and beyond. One of the things I care the most about is reducing the amount of toxins I’m exposed to, because living a healthy life is much more than eating well and exercising. As a health and wellness advocate, I want to share how oral health is strongly connected to our overall wellness – this is yet to become popular knowledge. Did you know for example that there are more bacteria in your mouth than people in the world? Wait, that’s not to worry about! Not all bacteria are bad ones and you can create an environment where you encourage a stronger concentration of good bacteria versus bad ones. How? I’ll explain it in a moment. Bad bacteria are those that can cause dental problems. Good ones naturally protect you. When we brush our teeth with aggressive products we wipe them all out, even the good ones… Oh, no! 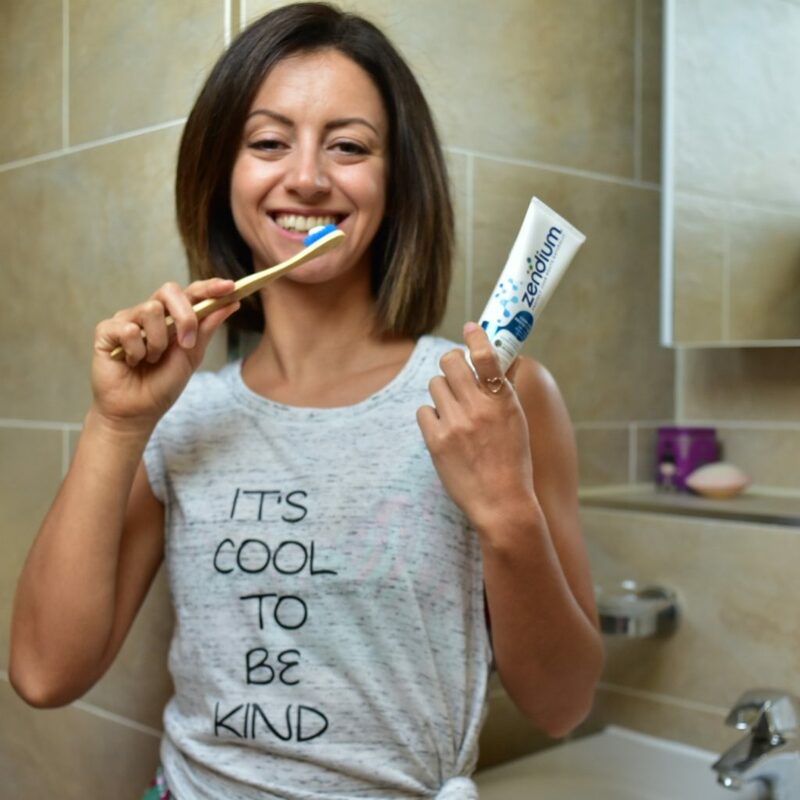 I have recently discovered a toothpaste brand that just landed in the UK (after being one of Scandinavian most trusted brand by dentists for many years), which protects the mouth naturally. Zendium boosts good bacteria while reducing bad ones and it does it gently. It uses the same enzymes and proteins to fight bad bacteria as the mouth utilizes. It protects the mouth the same way nature intended to. What I love about it is that it does not contain some nasty ingredients commonly found in other toothpaste brands: triclosan, parabens and SLS which have been associated irritation. The gentle taste of Zendium, makes it ideal for kids (they also have a specific product for them), pregnant women and anyone who might find the minty taste of other brands too strong. Also, the delicate aroma, doesn’t interfere with the sense of taste, meaning you can eat straight after and actually enjoy the food. Oral health isn’t just about a pretty smile! Did you know poor oral health has been associated with diseases such as diabetes, heart and cardiovascular conditions and premature birth? It is shocking how little we know in the western world about the importance of keeping the mouth in top conditions and how that impacts the rest of the body! Interestingly, Ayurveda, yoga sister science, has been saying that the mouth is a window on what’s going on in the rest of the body for hundreds of years. Ayurveda also believes that oral hygiene impacts deeper tissues in the body far more than we might imagine. Oral health isn’t just affected by how often and how well we brush our teeth. It is a byproduct of our nutrition, overall health and stress levels. A good oral health enhances your sense of taste, which is strongly related to an overall sense of satisfaction in life. It bolsters digestive strength, as digestion begins in the mouth. In fact, almost immediately after ingesting food and drinks, enzymes in the mouth begin the digestive process. A healthy mouth promotes optimal digestion. Choosing Zendium means working in harmony with the body, not against it. It is very delicate on the gums and tissues of the mouth, making it suitable even to those prone to mouth ulcers and sensitive gums. If you would normally use a generic toothpaste, you will notice Zendium does not foam as much as other largely sold brands. This is becasue they use a gentler foaming agent, which is kinder on the gums and skin of the mouth. The health of your mouth has a lot to say about the health of your body and vice versa and it can affect that of your body. Taking care of your oral health is an investment on your overall health!